There are a few people in Vegas that I follow on twitter that share similar tastes in food as I do. When it comes to burgers there’s really one person I listen to and that’s @Vegasburger, Erik from Vegas Burger Blog. He hit the mark on every place I visited that he recommended last year in his 8 Great Burgers in Las Vegas blog post (on AC2LV). We don’t agree on everything but when he gets excited I do to. His excitement for the burger at Pizza Rock made me drop everything the next day and head to Downtown Grand (Of course I stopped in the casino) and Pizza Rock. The Burrata Burger was EASILY the best burger I’ve had in Downtown Vegas and one of the best new burgers I’ve eaten in Las Vegas in the past year. 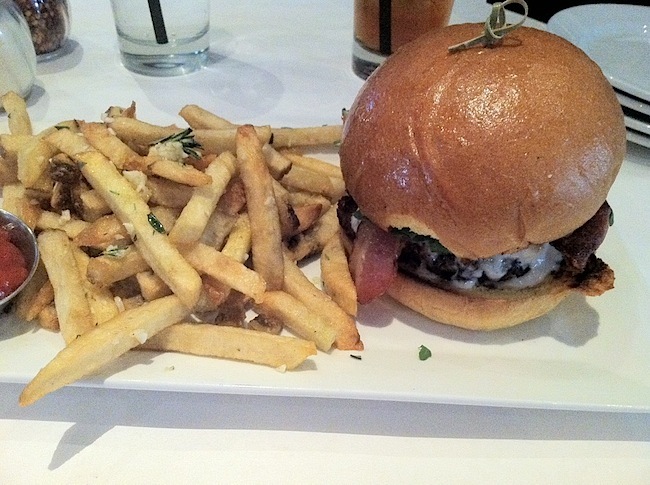 The Burrata burger is American Kobe Beef, Burrata Cheese, Crispy Bacon, Caramelized Onions, Arugula, Balsamic Reduction. I got my burger sans onions. The burger comes with a side of super crisp french fries topped with crazy garlic and was $13.50 minus a 15% discount for a) being local or b) foursquare check in. 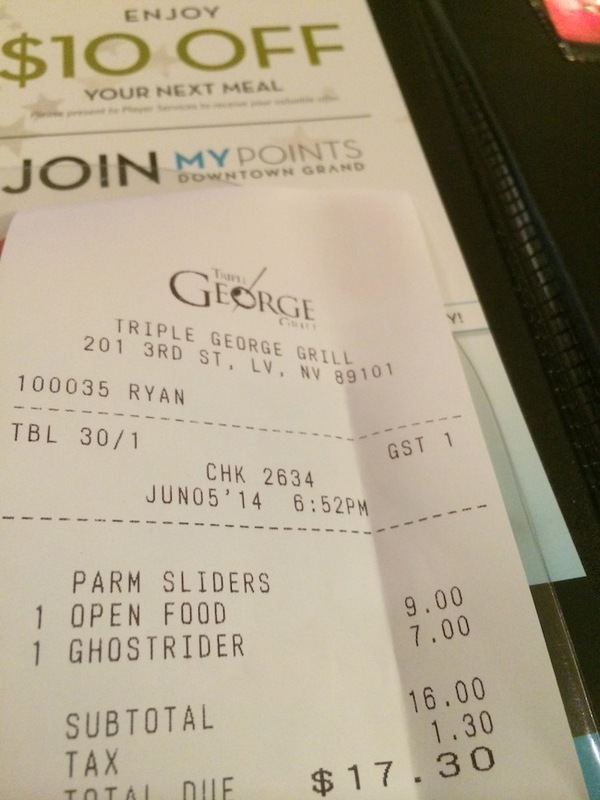 This is a bit pricey for Downtown Vegas but would cost $18 for the burger alone on the Vegas Strip. I could taste each element on the burger on every bite. The bacon was crisp enough to be good but not too crispy to break apart in one bite. Generally, I think grinding kobe beef is silly but the beef made for a delicious burger and brought everything together. Even the bun had its own flavor. Damn, writing about this makes me want one for lunch. I’m a New Yorker and never think highly of Las Vegas pizza but I enjoyed the pizza at Pizza Rock. It’s not the pizza I grew up with but was good and made with fresh ingredients. For comparison, I love the pizza but the burger at Pizza Rock is about 1000% better. 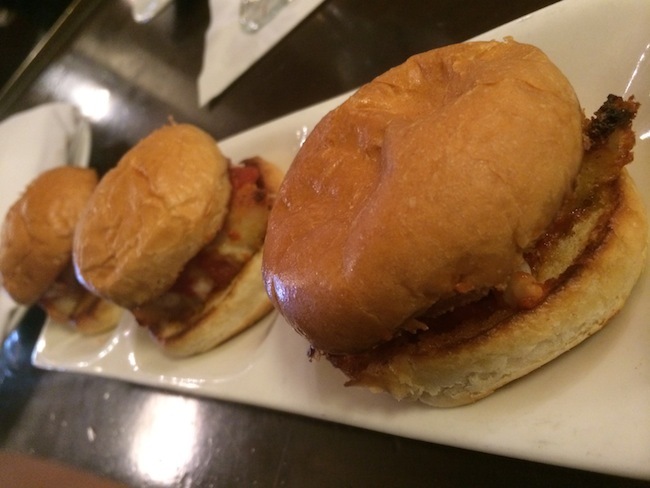 I love the burger, like the food, enjoy the rock jams and consider Pizza Rock my newest crush in Downtown Vegas. When I first heard about outdoor gaming at Downtown Grand I freaked out a little. I envisioned a closed off street with a pit of blackjack and craps tables. My initial thoughts were grand. I saw a big street party surrounding my favorite leisure activity. My visions of grandeur were quelled a little as the PR people repeated that there would only be two blackjack tables and a non-craps dice game. That’s okay, I still had grand visions. I’m a dreamer and I like awesome things. The outdoor gaming area wasn’t open for the soft opening over the past few weeks but grand opening of Downtown Grand is today and the blackjack tables have been placed outside. The dice game isn’t available to play just yet. 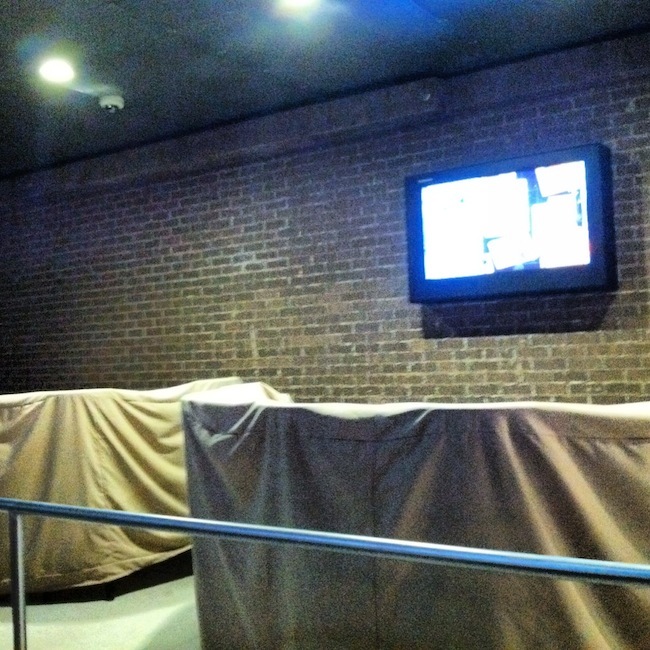 Both blackjack tables face a wall with a TV on a raised part of the sidewalk with a bar separating the space. I don’t want to stare at a wall when I gamble and I don’t want to leave my back exposed to anybody just walking down the street. Anyone on the street could sneak up on players and do whatever without them having any idea that they could be in harm’s way. Downtown Vegas may be safer than it was 10 years ago but it’s still not the safest area in Las Vegas. This feels unsafe. Facing a wall and gambling feels unsafe even when it’s inside the high limits room at Downtown Grand with security personnel nearby and hundreds of cameras. There’s less risk inside but facing a wall and not seeing what’s around doesn’t feel comfortable. Underwhelming and unsafe seem like appropriate descriptions of the outdoor gaming at Downtown Grand. Maybe that feeling will change when the tables are up and running but I doubt it. 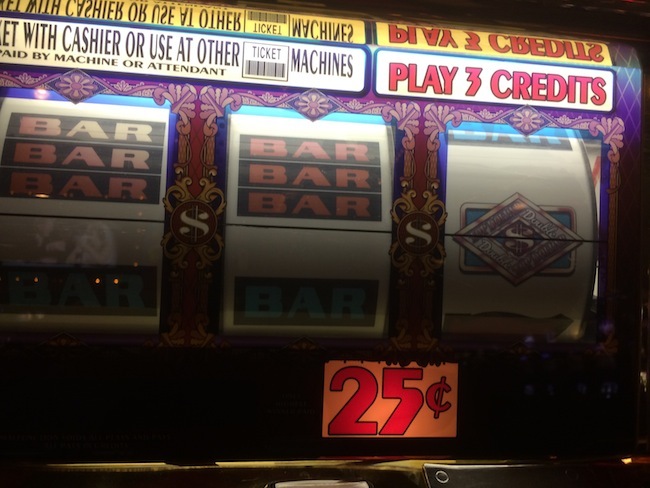 At least the blackjack inside Downtown Grand pays 3:2, is dealt from a shoe and has $5 minimums. I spent much of the day Monday exploring Downtown Grand. I have mixed feelings on the HOTEL casino. Overall I love the vibe and decor. 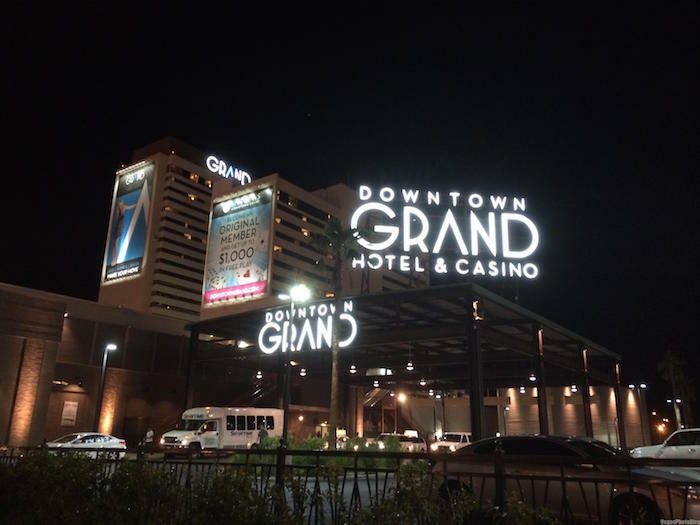 Downtown Grand, like Cosmopolitan before and SLS Las Vegas next year is a hotel that has a casino. There are 16 restaurants and 650 hotel rooms that are a part of Downtown Grand complex. There are about 10-15 gaming tables and a very small sportsbook with just 12 chairs. Gaming is an amenity. It’s not the focus for Downtown Grand. That’s just the way the Las Vegas casino market is today. The casino resort I grew up loving is changing into a hotel casino. I might as well get used to it and enjoy it for what it is. 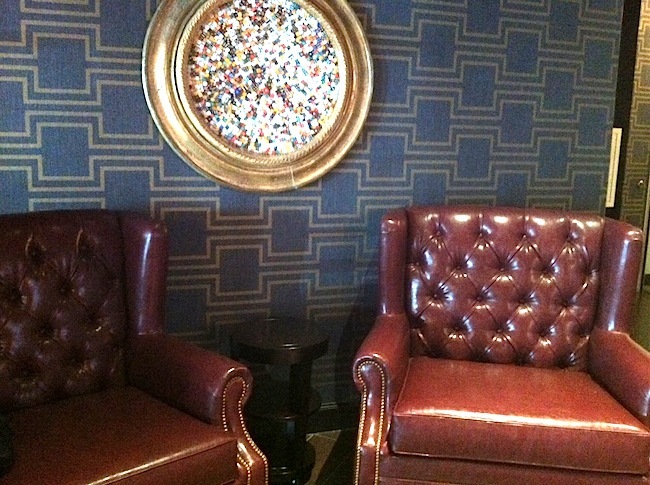 The photo above ia a couple of huge leather chairs and a piece of art constructed of hundreds of dice in the lobby. The chairs are so comfortable that I could have sat there waiting for other people to take pictures for hours. Downtown Grand is a beautiful hotel that I can enjoy. 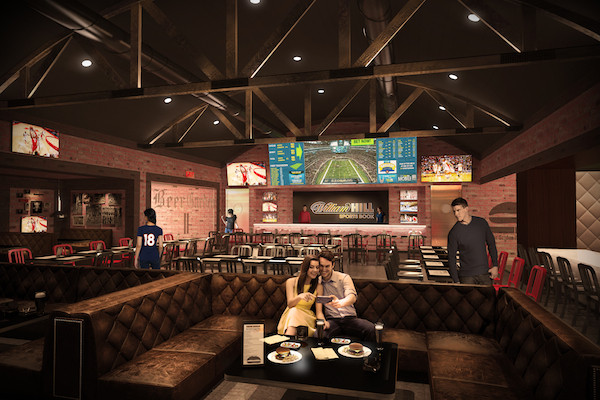 I’m not sure I’ll gamble much at Downtown Grand but I’ll certainly enjoy some drinks and wifi in one of those chairs. I have pictures on the ECG Tumblr but you should check out the awesome coverage on Vital Vegas and Vegas Chatter.